We specialise in the installation of condensing boilers and renewable energy products from Worcester, using the latest technology available. Modern condensing boilers improve efficiency to over 90%. Finance is now available on these products and services and we can offer two to ten years flexible payment plans. Please click below to find out what options are available, or contact us to discuss your requirements. Save yourself valuable time by using our quote request form to obtain a free no obligation quote. When you've accepted our quote, we can arrange your boiler installation at a time that's convenient to you. 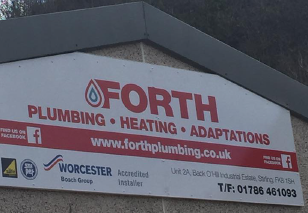 Forth Plumbing & Heating install A-rated Worcester Bosch boilers which come with up to a 10 year guarantee for complete peace of mind. 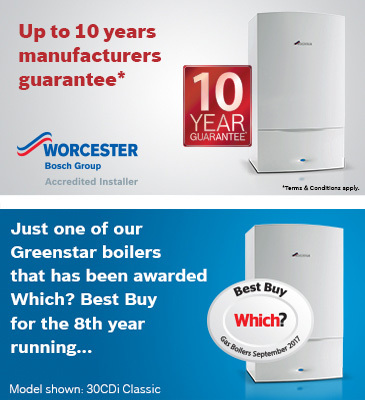 We are a Worcester Accredited Installer and are able to offer a 10 year guarantee as standard on new gas boilers and up to 10 years dependent upon installation alongside other Worcester products. With extended guaranties on all oil installations. We have the knowledge and expertise needed to ensure that you receive nothing but the best service. Our reputation has been developed through hard work and reliability which is why we are the area’s number one choice for plumbing, gas and oil related work.